Cameroon, officially the Republic of Cameroon (French: République du Cameroun), is a country in west Central Africa. It is bordered by Nigeria to the west; Chad to the northeast; the Central African Republic to the east; and Equatorial Guinea, Gabon, and the Republic of the Congo to the south. Cameroon's coastline lies on the Bight of Bonny, part of the Gulf of Guinea and the Atlantic Ocean. The country is called "Africa in miniature" for its geological and cultural diversity. Natural features include beaches, deserts, mountains, rainforests, and savannas. 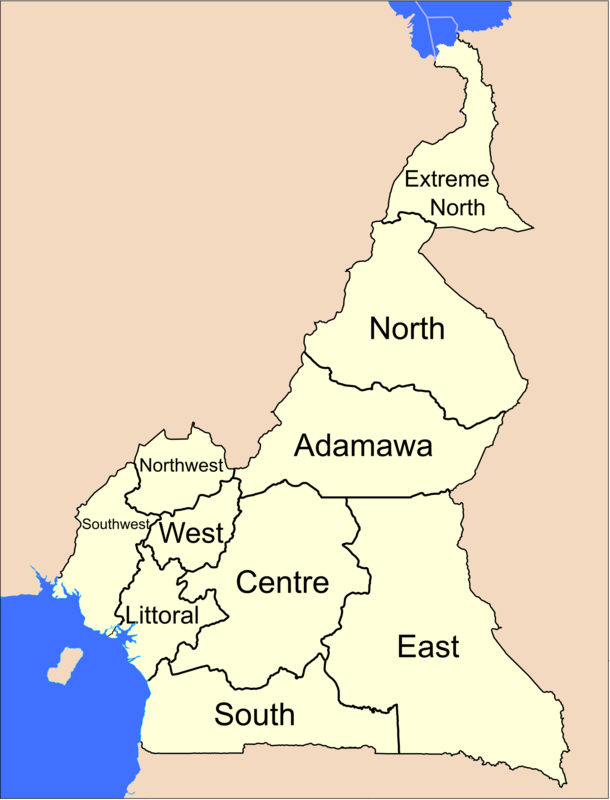 The highest point is Mount Cameroon in the southwest, and the largest cities are Douala, Yaoundé and Garoua. Cameroon is home to over 200 different linguistic groups. The country is well known for its native styles of music, particularly makossa and bikutsi, and for its successful national football team. French and English are the official languages. At 475,442 square kilometres (183,569 sq mi), Cameroon is the world's 53rd-largest country. It is comparable in size to Papua New Guinea and somewhat larger than the U.S. state of California. The country is located in Central and West Africa on the Bight of Bonny, part of the Gulf of Guinea and the Atlantic Ocean. Cameroon lies between latitudes 1° and 13°N, and longitudes 8° and 17°E. The climate varies with terrain, from tropical along the coast to semiarid and hot in the north. Exceedingly hot and humid, the coastal belt includes some of the wettest places on earth. For example, Debundscha, at the base of Mt. Cameroon, has an average annual rainfall of 405 inches (10,287 mm). Cameroon has a high level of religious freedom and diversity. The predominant faith is Christianity, practiced by about two-thirds of the population, while islam is a significant minority faith, adhered to by about one-fifth. In addition, traditional faiths are practiced by many. muslims are most concentrated in the north, while Christians are concentrated primarily in the southern and western regions, but practitioners of both faiths can be found throughout the country. Large cities have significant populations of both groups. There is significant internal migration. There are currently no active religious political parties. The constitution divides Cameroon into 10 semi-autonomous regions, each under the administration of an elected Regional Council. A presidential decree of 12 November 2008 officially instigated the change from provinces to regions. Each region is headed by a presidentially appointed governor. These leaders are charged with implementing the will of the president, reporting on the general mood and conditions of the regions, administering the civil service, keeping the peace, and overseeing the heads of the smaller administrative units. Governors have broad powers: they may order propaganda in their area and call in the army, gendarmes, and police. All local government officials are employees of the central government's Ministry of Territorial Administration, from which local governments also get most of their budgets.